MiCA is two triangular towers where Milwaukee meets California. Residences feature a contemporary aesthetic, thoughtful floor plans and beautiful amenity spaces. A new public plaza along Mlwaukee Avenue adjoins and connects the two towers linking MiCA residents with the Logan Square Community. Steps away from MiCA brings you to public transportation, diverse cultural experiences and unique food and drink. 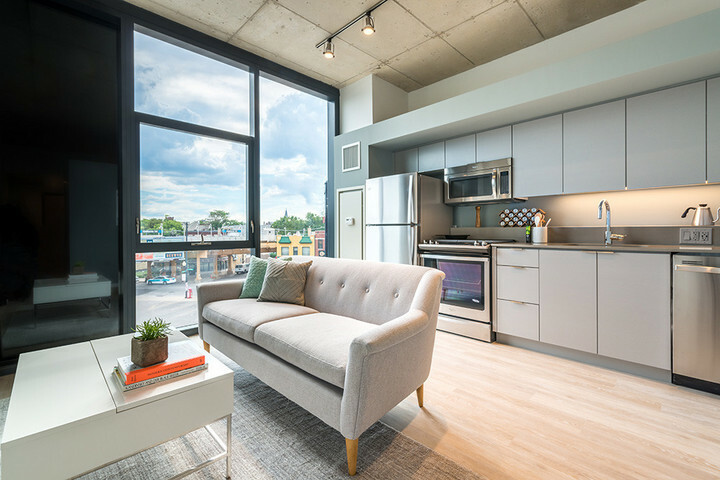 Spacious units featuring contemporary finishes and 10' or 11' ceilings. Large floor-to-ceiling windows bring in maximum light. Wide plank wood-style flooring create light and bright spaces. Kitchens feauture stainless steel appliances, garbage disposals, gas stovetops, dishwashers, durable quartz countertops, ice makers and balconies in select units. Find utmost comfort year-round with on-demand heating and cooling. AT&T U-verse Cable and Internet is part of an all-inclusive utility package. Base services include 1 Gbps Internet, one HD-DVR cable box and appox 300 channels. Hardline and VoIP phone services are available. Residents are responsible for a monthly utility fee which includes the cost of water, sewer, gas and trash. and AT&T U-Verse Cable & Internet. Residents are responsible for electricity within the apartment home through ComEd.